After an SDL-enabled application has registered successfully. When the device was reconnected after an unexpected disconnect and a previously connected SDL application reregisters. SDL makes a decision if the data resumption process is applicable for the application. When the HMI sends an OnFindApplications notification via the users request. Data resumption means that an application may request to restore data used in the previous ignition cycle after an Unexpected Disconnect. 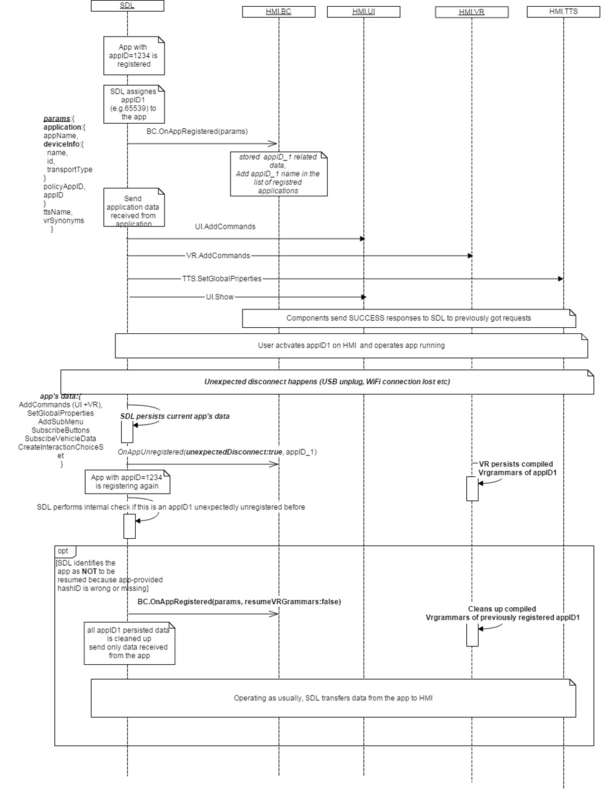 For data resumption purposes, SDL must store application-related data such as commands, application global properties, and show data for the past three ignition cycles after an Unexpected Disconnect or Ignition Off. On the fourth Ignition On, SDL clears all corresponding application-related data used for resumption. HMI must store the VR grammar compiled for applications that are unregistered by an Unexpected Disconnect or Ignition Off. During data resumption, the HMI may also have to resume the previous audio source. Refer to BC.OnResumeAudioSource. SDL will provide OnAppRegistered with resumeVrGrammars:true to notify the HMI that VRGrammars must be resumed. On this event, the HMI must restore the application related VRGgrammars for the appID received via an OnAppRegistered notification. SDL will provide OnAppRegistered with resumeVrGrammars:false or no resume parameter at all. SDL cleans up all previously stored application data for the application that failed to resume. The HMI must also clean up previously compiled VRGrammars for the application. The application will send new data to start SDL operations. 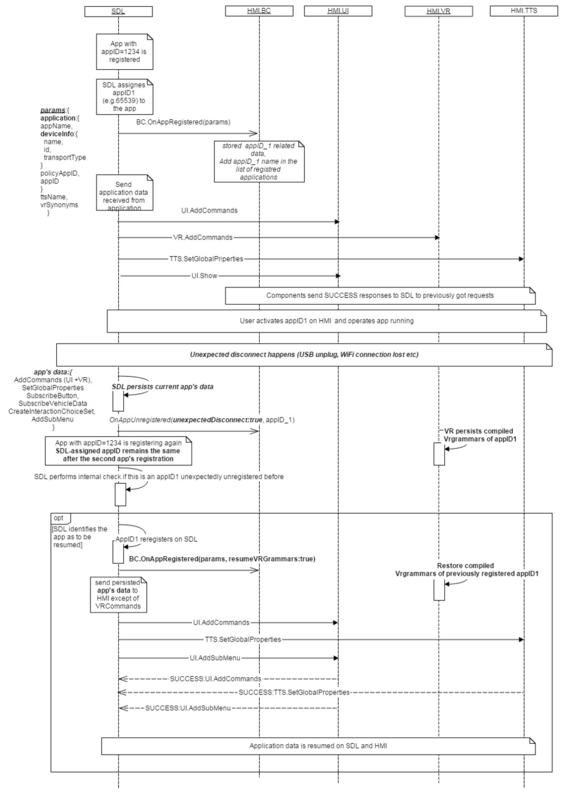 In this event, SDL and the HMI should restart the cycle of collecting application data for resumption. Update its list of registered applications. Store the application data sent in the applications parameter. Compile and store VRGrammars for the vrSynonyms parameter, and arrange them for the user to be able to use via voice recognition. Note: The VR commands to activate an application must be accessible when viewing a different active application or the list of registered applications. Provide the user with the possibility to choose an application among a list of registered applications. Send an OnAppActivated notification to SDL when the user activates an app via the UI or VR. Manage application events by priority. HMI gets proirity information from OnAppRegistered, UpdateAppList, ActivateApp HMI API. HMI must set app icon and create the app title in the mobile apps list in case SDL provides <icon> via OnAppRegistered notification. HMI must set default app icon in case SDL omits <icon> at OnAppRegistered notification. If a device is connected over USB and registers an application, SDL will send OnAppRegistered with a hash of the usb serial number as the device id. If a device is connected over Bluetooth or Wi-Fi and registers an application, SDL will send OnAppRegistered with a hash of the device's mac address as the device id. When the application is registered for the first time (no records in PT) PoliciesManager should not initiate prompting the User about the event. 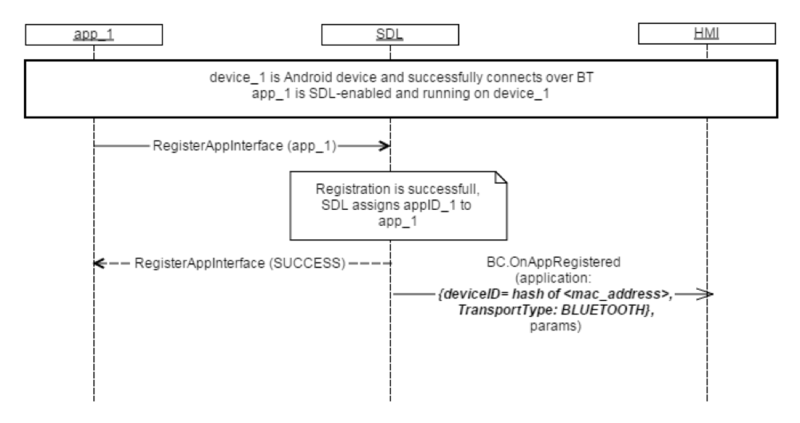 If iOS device was connected over Bluetooth with applications registered and running on SDL and was also connected over USB, SDL must start reconnection timer and NOT send OnAppRegistered to HMI.